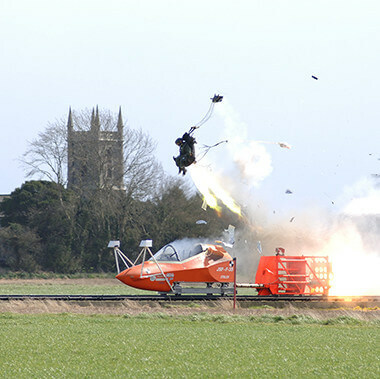 Pyrotechnics have always played a large part in the design and production of our ejection seats and, most importantly, their ejections. Martin-Baker manufactures and tests all of its own pyrotechnics at the historic RAF Chalgrove Airfield. Chalgrove Airfield was opened in 1943 and was used by the RAF and the United States Army Air Force (AAF-465) – during WWII, it was used primarily as a combat reconnaissance airfield. The Pyrotechnic devices for Martin-Baker were originally manufactured at Denham, but were transferred to Chalgrove in 1986, after a purpose-built factory was established. We’re in the process of changing the Chalgrove site to incorporate both the UK ER2014 (Amendment) 2016 Regulations and also the US Regulations DOD4145.26-M. As per these regulations, site plans are available on-site for viewing by the designated DCMA Safety Officer. Interested in finding out some more about the world’s leader in ejection seats? Get in touch with Martin-Baker today.